Amidst the chaotic and metropolitan environment of Southern California, The Wild Reeds channel positive attitudes while blending encouraging messages to create thoughtful folk rock songs. Originating as a trio in 2009, the band continues to grow. The three original members Sharon, Kinsey, and Mackenzie have maintained their roles as lead singers, providing golden cross-harmonies and silvery melodies with the backing of instruments such as guitar, banjo, and harmonium. In recent years, members Nick J. and Nick P. expanded the band’s sound with the addition of bass and percussion. The Wild Reeds have several things on the horizon, such as the upcoming release of their album Blind and Brave and a spot in the Way Over Yonder festival lineup- the west coast version of the Newport Folk Festival. With much to look forward to The Wild Reeds are a real threat in taking over the emerging music scene. The band originally started as a trio and has since become a five-member group. How do you feel the band has benefited from this change? Since becoming a five-piece, we’ve worked really hard to gel together in order to let the songs shine. It was important to find a rhythm section that would sit back when needed, so we could keep an emphasis on our harmonies. The great thing about have a bigger band is that we have much more to work with- more elements and layers. Our songs are now able to reach a higher potential and a literal higher decibel. Where did the name The Wild Reeds come from? The name “The Wild Reeds” came from an old fable called “The Oak and the Reed”. In the tale, a proud oak tree is surrounded by a field of reeds. The oak tree speaks down to the reeds because they bend and sway every time the wind comes. What the oak tree didn’t know was that they bend but do not break, and when a huge storm hit, the oak tree fell over. The fable teaches that you must have endurance, and especially to not be prideful. We’ve taken the story to heart and it’s sort of our main motto. It is interesting to see a band with such a folky sound come from Southern California. Where do you feel the inspiration for your music has come from? Our inspiration comes from all over. When it comes down to it, the folky sounds we are drawn to usually have an emphasis on the lyrics. The point of our songs is to connect and especially to let the emotions out that we feel. We’re inspired by honesty and vulnerability, and I think the folky sound is just so warm and bare that it compliments the lyrics well. The band is set to have an album release party at The Troubadour in West Hollywood. This must be very exciting. How does it feel to be releasing a new album and performing at such an iconic venue? It feels so great! We actually have quite the soft spot for The Troubadour, as Kinsey and I (Sharon) actually met there about 5 years ago at a Lisa Hannigan concert. There really is a strong positive presence there and we are inspired whenever we play the room! We are so amped to release Blind and Brave, it’s been burning a hole in our pockets. We’ve been putting in every effort to make August 9th a great one. What can we expect from your upcoming album, Blind and Brave? You can expect real, honest songs and anthemic ones. Having three songwriters, our tunes may have different styles and instrumentation, but it all flows together into one album. You can expect encouragement and heartache in the same song, usually ending on a positive note (no pun intended). 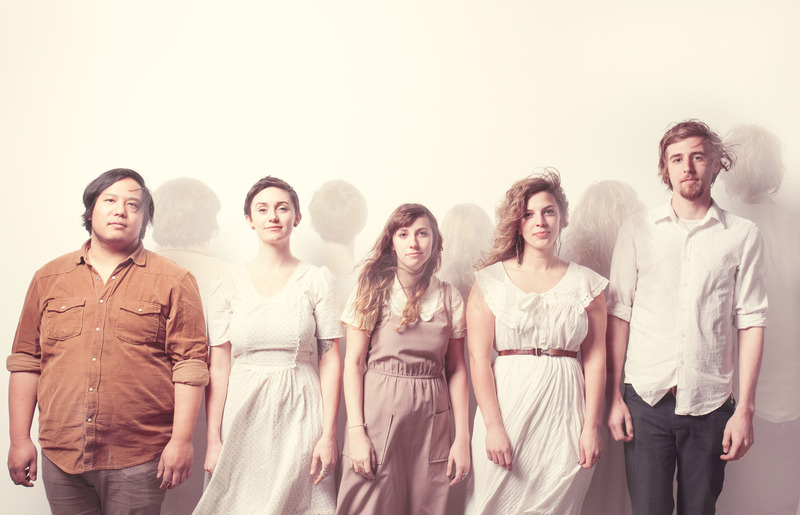 The sound the band creates has been compared to artists like Jenny Lewis and Fleet Foxes. How would you define your band’s sound? We were on tour in the northwest once and we saw a singer-songwriter play a heart-wrenching and dramatic tune all acoustic at a house show. Our eyes got big and some of us cried (as we often do haha). It was heavy and from the core. We came up with (if it’s not already a thing) the genre known as “heavy folk”. It makes us laugh because it sounds something like a mash up of acoustic guitars and metalcore, but we’re just trying to present the best versions of our songs so that they hit home for us, and everyone listening. I think that Fleet Foxes do that really well. The powerful harmonies lift the songs to a new level. With Jenny, we love the determined yet casual attitude she gives off and of course her catchy, heart-felt tunes! We hope to be a memorable band like the two of them, and we are thankful for them paving the way for indie/pop/folk groups. This entry was posted in Uncategorized and tagged Folk, Folk Rock, Interview, Music, Q&A, The Wild Reeds. Bookmark the permalink.